Brilliance in luxury melamine! A tribute to everyone’s favorite leafy greens, Beatriz Ball’s medium VIDA Lettuce Platter is absolutely fabulous for serving your favorite organic foods, and makes a stylish and pactical tray for fresh fruit on the kitchen island. 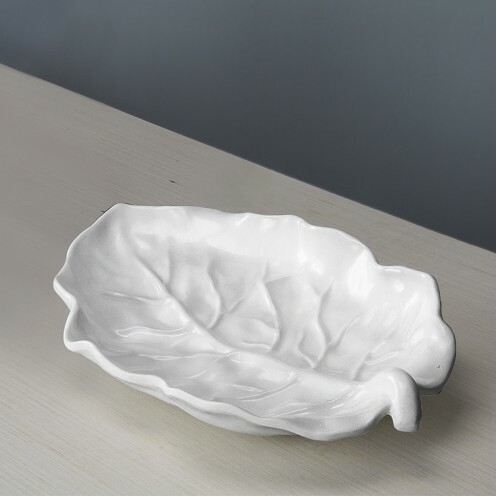 Generously sized, the medium white Lettuce platter boasts rich naturalistic details, and ample serving potential. Stunning when displayed alone, it can be paired with any Lettuce items for a great serving set. Lovely on the patio table for your next outdoor gathering, or on your dining table when friends come to call. Has the substance, weight, and appearance of a ceramic item, but is made of luxury melamine for everyday enjoyment. Dishwasher safe (top rack), heavy-weight, break resistant and durable, food safe, BPA and PABA free. Check for availability as stock changes daily.